5ft x 3ft x 1.5 inch. Outstone Inflatables mats measure 5ft x 3ft x 1.5" and are manufactured using the same 610oz cape grain material as our inflatables making them very tough. The foam used is 1.5" but is adequate to offer the identical impact protection as some of the 2" foam used on in the marke todayt. All of our foam and PVC is flame resistant. The mats can be manufactured then twisted inside out meaning just a single side will show any sewing. Let us know if you have a preference when placing your order. Our mats are double sewn using bonded nylon rot-proof thread. These mats can be used for most tasks within the entertainment and play market such as aerobics, soft play and yoga. Outstone mats can have reattachable links added to the bottoms of individual mats to connect mats together - ideal for covering a larger surface area without gaps. Whether you wish to order one mat or five mats. We offer some fantastic deals on large volumes. Distribution is made using 48hr courier service or pallets within the UK, or your welcome to collect at our manufacturing unit in Cheshire. We can deliver our items worldwide. Did you know? 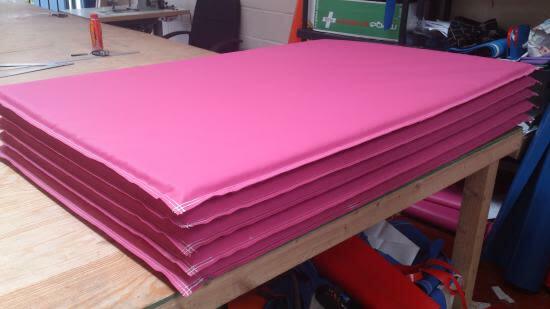 We can print your logo or directly on to these mats then liquid laminate them for added protection. Contact us today for a quote.